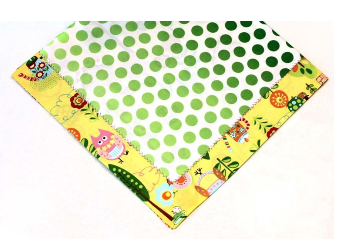 This blanket makes a wonderful baby gift or lightweight lap throw. Skills covered in class include accurately cutting fabric, marking fabric, sewing straight seams, a simple mitered corner, and how to be successful at decorative stitching. Note on fabric choices: Cotton fabrics are easiest to use, so more cotton content in a cotton blend is best. Synthetic fabrics are more difficult to use. Fleece-type fabrics are difficult to use. A contrasting color sewing thread or decorative thread for the decorative stitching. Sharp pins with large heads, a pincushion, sewing scissors, seam ripper, brush to clean out sewing machine. Machine wash, dry, and iron all fabrics. My contact information for questions: Sheri Roach (907) 458-7501 or cherishedneedlecreations@gmail.com.